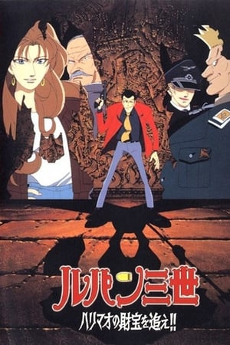 Lupin III: Harimao no Zaiho wo oe!! Lupin's on the trail of a decades-lost treasure - the collected booty of World-War-II-era thief Harimao, worth billions of dollars. But as he plans to con retired British spy Sir Archer into giving up the location of the stash, Archer himself gets into the hunt. Lupin now has to team up with his former mark to outwit a more sinister opponent who wants the treasure for himself. And of course, Zenigata's on the scent and gunning for the gang once again. Rupan Sansei: Harimao no Zaiho wo oe! !